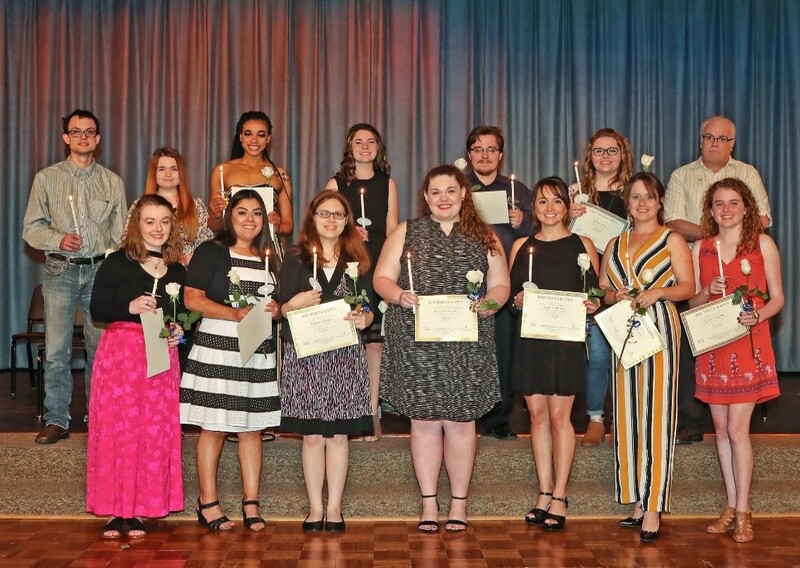 HILLSBORO, TEXAS—The Nu Xi Chapter of Phi Theta Kappa at Hill College held their spring induction ceremony March 27 in the Vara Martin Daniel Performing Arts Center on the Hill County Campus in Hillsboro. Thirty students were inducted into the chapter. The Nu Xi Chapter of Phi Theta Kappa was chartered by Hill College on Nov. 17, 1964. PTK is the international honorary scholarship society for community and technical colleges. The purposes of the society are to promote scholarship, develop character and cultivate fellowship among the students of the community colleges of the U.S. 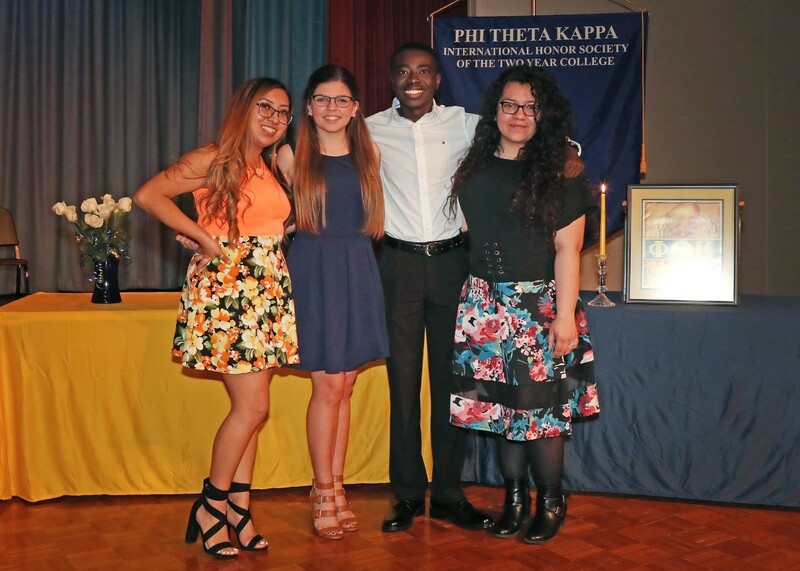 The mission of Phi Theta Kappa is to recognize academic achievement of college students and to provide opportunities for them to grow as scholars and leaders. To be eligible for membership, students pursuing an associate degree (AA, AS, AAT, or AAS) must have completed a minimum of 12 hours of college-level coursework at Hill College counting toward degree requirements, must have a 3.50 cumulative GPA in all coursework attempted at Hill College, must be TSI complete, and must be currently enrolled in classes at Hill College. Students enrolled in a one-year certificate program must have completed a minimum of six hours of college-level coursework at Hill College counting toward the one-year certificate requirements, must have a 3.50 cumulative GPA in all coursework attempted at Hill College, and must be currently enrolled in classes at Hill College. PTK faculty advisors are Dr. Jenny Corder, drama instructor, and Jim Williamson, psychology instructor. Chapter Officers (L to R): PTK President Monica Noriega, Cleburne; Burleson Center Representative Kaitlyn McDonald, Burleson; Recording Officer Dennis Nkrumah, Burleson; Vice President Ashley McCarley, Burleson. Not pictured: Johnson County Campus Representative Jayden Bryeans, Cleburne. Inductees Front Row (L to R): Madison Mackin, Burleson; Christina Byrd, Cleburne; Patricia Cannon, Burleson; Madison Manson, Burleson; Kayla S. Roberts, Burleson; Monica Frasier, Cleburne; Claire Vallaster, Burleson. Back Row (L to R): Ethan Awtrey, Bynum; Tamela Brogdon, Abbott; Jade Bradley, Mesquite; Abigail Downs, Grandview; Justin Allen Hart, Burleson; Rachel Shaw, Grandview; Bryan Toth Sluder Garland.